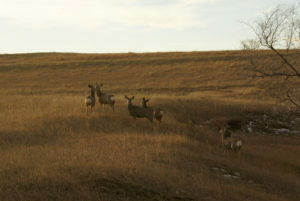 Kansas Mule Deer hunting appears to be a great unknown for many. Not only does Kansas have a good Mule Deer hunting there are a good number of trophy quality Mule Deer racks. Many western Kansas pheasant hunters can attest to. A challenge with Association Kansas Mule Deer hunting is not quality or number of racked Mule Deer, or quality of Mule Deer habitat it is difficulty of drawing a Kansas Mule Deer tag. For those non-residents that draw a Kansas Mule Deer tag they have a good opportunity. It should be consider their once in a lifetime Kansas chance. To make most of any hunting opportunity we will assist with where to hunt. We will give a farm listing of known Mule Deer populations. 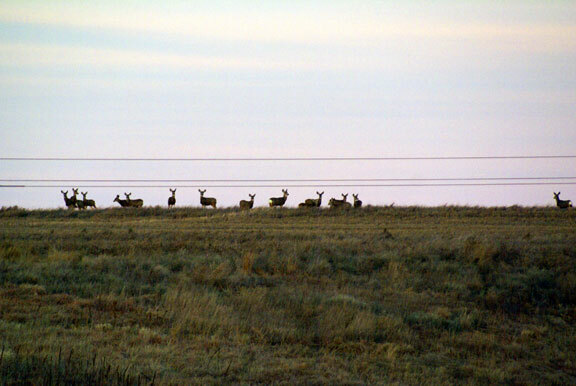 These pictures are of western Kansas Mule Deer on typical open lands Mule Deer occupy. Well known to upland bird hunters as well as a minority of deer hunters. To hunt such lands requires a patience to sit to glass superior to most Whitetail Deer hunters who find scouting/hunting in woodlots less tiresome. 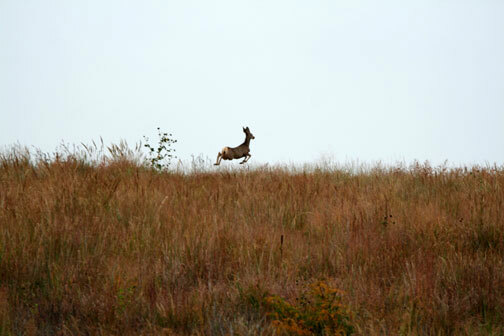 A fact that we recognize requires actual boots on the ground experience Kansas Mule Deer hunting to be believed. Our exposure to a handful of first time open lands deer hunters traveling from heavily wooded home states teaches us such things. 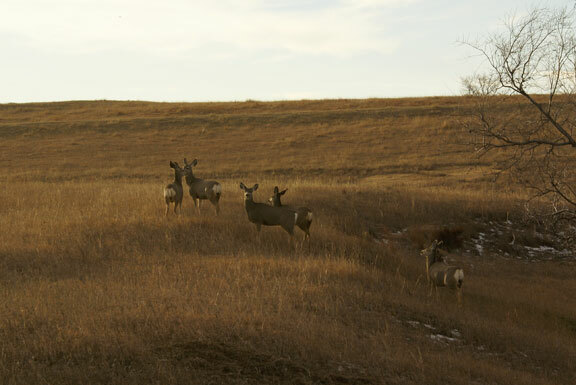 Kansas Mule Deer hunting is far different than Rocky Mountain eastern slope or desert southwest that has been a long time favored destination for Mule Deer hunting. Along with two seasons Mule Deer hunting advantage on one Kansas tag gives more opportunity than other Mule Deer regions. Another advantage is uphill walking is much less, there are no cactus, horses not required. 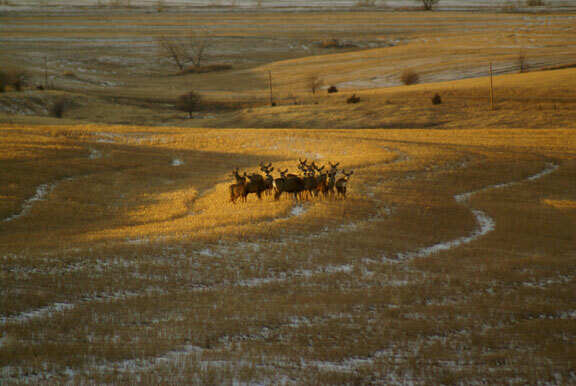 For those that have gone Mule Deer hunting in more rugged areas Kansas will seem like a Hollywood hunt. Being a great plains state, as flat as it gets. 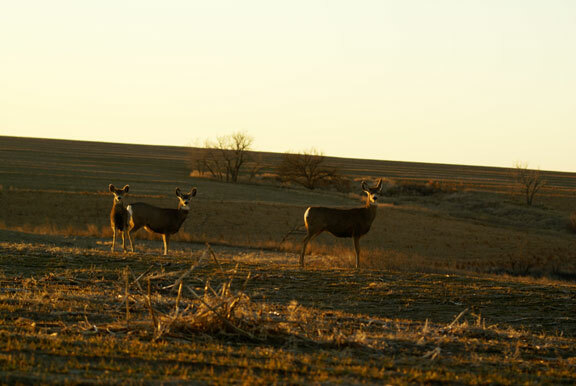 A final advantage is our Kansas Mule Deer hunting is all on private lease land we secured for our exclusive use. 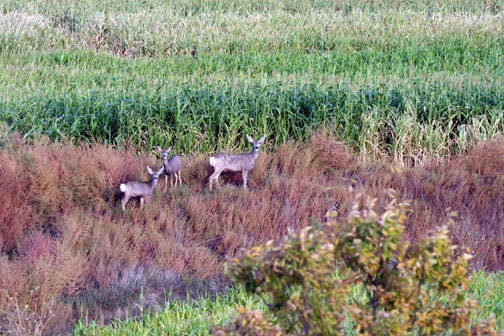 Kansas Mule Deer regions include river country. Using river may be deceiving as indicating water. Year round water source is a valuable commodity, more rare than our use of river may indicate. Opening is an aerial photo, two ground level photos, all a portion of a contour map of what Kansas Mule Deer habitat looks like. Photos below are of Medicine Lodge River drainage where we contract a large with several small Mule Deer holding ranch’s. Visible river line may look like it contains water. What its dark line actually are is brush and trees that grow along its edge. Aerial photos are often deceiving as to ease of ground navigation. Common to Kansas. While walking is easy with long observation our open land shown below contains many draws that can hide herds without any hunter ever finding them. 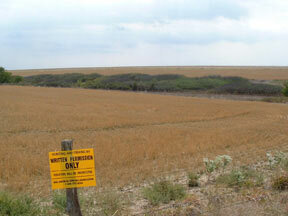 A photo covering only a portion of this ranch which is just a portion of tens of thousands of hunting acres under lease in several Kansas Mule Deer management units. This particular ranch has sufficient habitat and space to support 9 hunters a season for firearms or muzzleloader. We have yet to have 9 deer hunters in a season. Just never enough tag holders. Archery hunters would be extremely challenged. A dry drain that runs into a tributary along the far ground bluffs. Seemingly of little topography each little ridge line crossed or bend walked around yields a new view of ground hidden from any other direction. Pictured right, a drain bottom of a draw halfway between the near draw in the photo above it and far ground bluffs. It may not appear to be good habitat, however this is the draw with a spring. Within 25 feet of this spring in any direction along its 30 foot length it was very hard to step anywhere without stepping on deer droppings. This little valley is a small as it looks and there are many of these little twisting hideaways that cannot be easily covered from anywhere. Once inside the next little valley is completely hidden. Kansas Mule Deer open lands hunting. 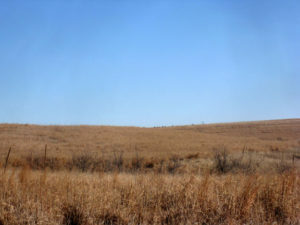 Pictured below is a panoramic picture of Mule Deer and the Kansas habitat they occupy. They are to the right of the silver oil storage tank. 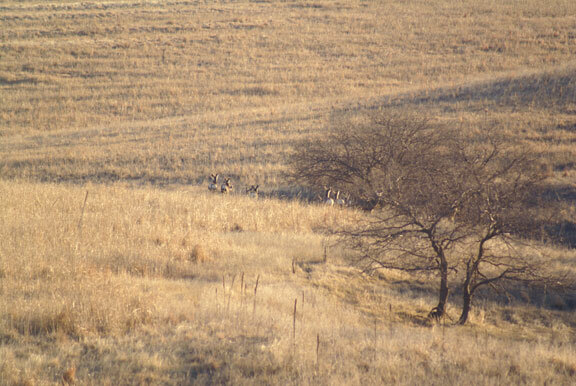 The last picture is an enlargement showing the Mule Deer. 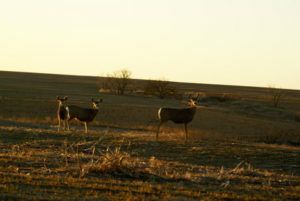 Overall, in Kansas the Whitetail Deer is king and the Mule Deer gets second billing. The limited number of Kansas Mule Deer tags is only part of the story of why this is the way it is. 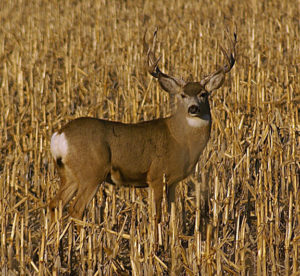 The other influence is that the Whitetail Deer’s greater following across the entire united States and represented in the over 46% the Association total membership that comes from outside of Kansas, Missouri and Iowa with non-resident deer hunters seeking Whitetail Deer over 60% of the deer hunter/members. These deer hunters want trophy Whitetail Deer as that is what they are familiar with, it is what Kansas is well known for and what they measure their deer hunting skill against. Another influence is that the Whitetail over the Mule Deer is the trophy whitetail is a far tougher animal to hunt and many times more leery of a hunter’s encroachment. 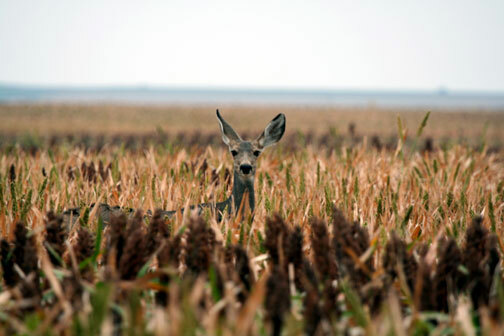 Contrasting to the whitetail is that it is common for Kansas Mule Deer spooked by bird hunters to stop and watch the bird hunter and his dog especially when beeper collars are employed or if a bird is shot. Many bird hunters have observed the Mule Deer simply stop easily within rifle range and stand motionless watching the bird hunt. Whitetail Deer in the same conditions would have let out for the county line leaving only the memory of their tail to the hunter. For those lucky enough to draw a Kansas Mule Deer tag we will encourage they pre-season scout every bit of land we recommend to them and hunt both the September and December muzzleloader or the archery season if they draw ether one of the available non-resident Mule Deer tag. The final bit of advice is not to shoot too quick as the average Mule Deer rack compared to a good whitetail rack looks huge. 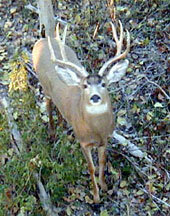 We have occasional 6×6 Mule Deer with mature 4×4’s seen each season. Any self guided deer hunters that have the time to deer scout and hunt hard will create their own opportunity to hunt some very nice Mule Deer, we provide the deer lease resource and local observations. A big first step. Do not discount this picture just because it is a doe. 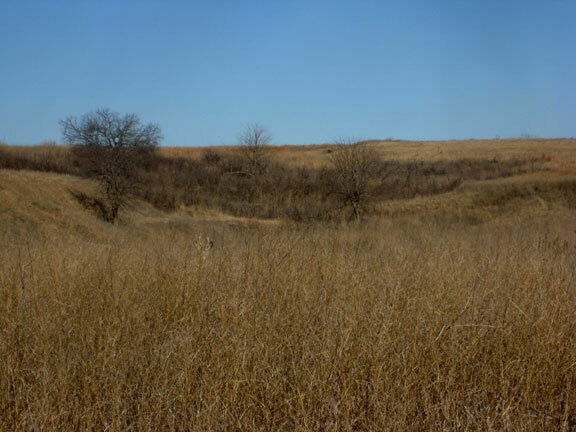 It’s value is the Kansas habitat it demonstrates. Just to give an idea of what some of our Mule Deer habitat looks like. A 300+ yard shot may well present itself. If the doe is here then the buck will be as well. John, A picture of my first mule deer shot with a muzzleloader and also pictures of opening day of pheasant season with my hunting partner Norman and our hunting dogs which work really well together. We were limited out by 10 AM that Saturday. Also this was the same area that I deer hunt. I have hunted all my life in Kansas and have never seen the quality of game that I see in this area. I have been very happy being a member of this club. 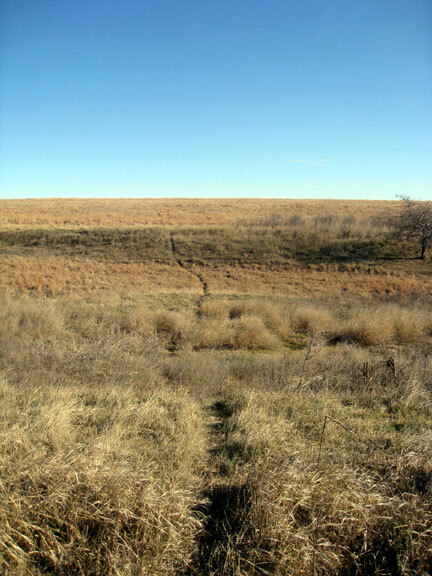 John K.
Kansas grasslands that hold Mule Deer give the appearance of easily patternable deer sign as this trail now over 12 years old on this fallow land that has consistently held a Mule Dee herd for longer than we have held the lease. This is the same drainage as the first picture of the Mule Deer head just above the weeds. 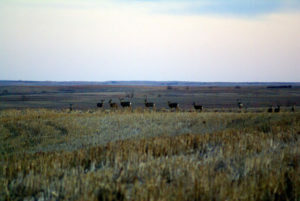 Kansas Mule Deer hunting as seen when pressured to hard. While this herd was pressured out of the weeds where loafing at no more than a baseball throw distance, they made good use of running a branch of the dry drainage avoiding our observation. 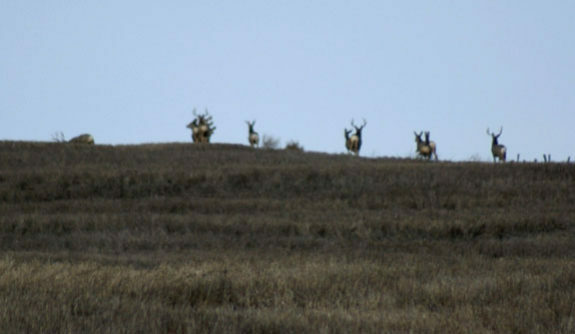 They stayed below the ridge until seen again and in time with camera just before crossing the far ridge. 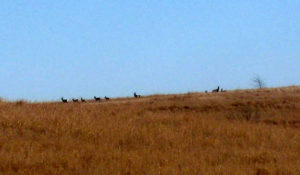 The nine animals in this herd is typical of Kansas Mule Deer herd size. 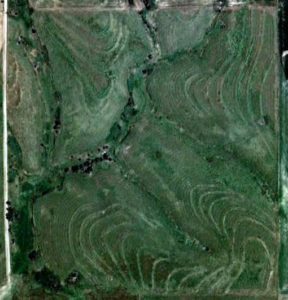 To put further perspective on this Kansas Mule Deer spot is the aerial of the land seen in pictures on this web page. Our lease is in this case a 160 acre, 1/2 x 1/2 mile, quarter section. 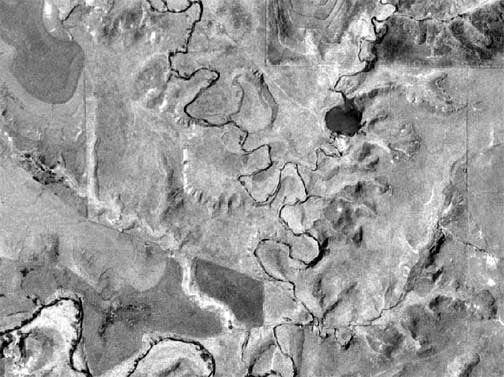 Over the years we have found aerials of Mule Deer country far less useful than that of whitetail country. Mule Deer seem to have a less reliable daily movement pattern even with being seemingly anchored to particular spots. Each of the drainage’s shown in the aerial would have to be stalked and while this particular drainage does have trees suitable for stand most successful Mile Deer are tagged by ground hunters. Those successful ground Mule Deer hunters commonly describe their movement at a mile an hour at the fastest. Those not willing to glass and remain motionless for long periods typically tell of bad hunts. This farm would be a first and last light spot. 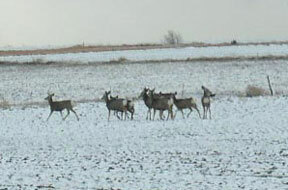 Kansas Mule Deer scenes. 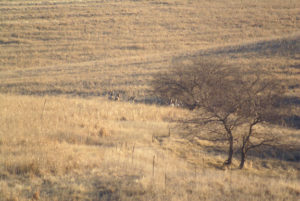 Through showing as many live Mule Deer pictures as we can the east slope Rocky Mountain and desert Mule Deer hunter as well as the experienced Whitetail deer hunter will see the terrain inhabited by Plains or in our case Kansas Mule Deer to be significantly different and requires eye calibration to pick the right hunting spots. Pheasant hunters get many Mule Deer pictures. Milo must be candy for deer. 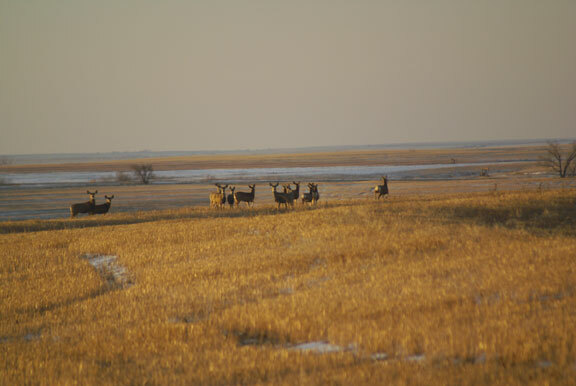 Kansas Mule Deer as captured by Association hunter Mike showing well the habitat to seek. Another Mule Deer attracting habitat is the brushy draw. The typical draw has Plumb Thickets of as little as 24 inches high to 15 feet covering various amounts of area, any of it may hide one or more Mule Deer. It is surprisingly how little cover is required to hide several Mule Deer from observation to as close as 50 yards. 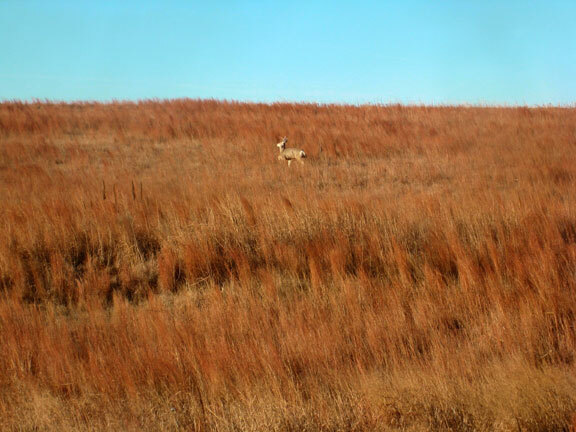 This type of habitat is typical to our Mule Deer hunting areas in NW Kansas and stands in contrast with the open Mule Deer habitat in our SC Kansas region. Scouting such an area relies on eyes on movement observation mostly at early morning and targeting trails that will appear well used due to Mule Deer’s highly habitual movement pattern. 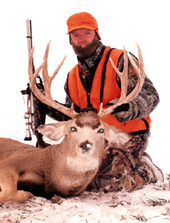 This entire draw lacks any tree stand trees requiring the Mule deer hunter to rely on ground blinds or stalking a significantly different hunting method compared to that of our most successful whitetail hunters. The yellow sign is a Mid-America Hunting Association sign marking our leased land. 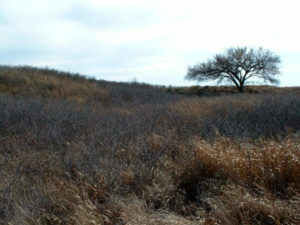 The high grass and head high plum thickets that serve as the primary Mule Deer bedding areas in the sparsely treed western Kansas both north and south. This one is particularly good as the low hills surround the thicket protect from the wind. While the picture appears to include easily traversed habitat the reality of the Plumb Thicket is that it is every bit difficult to move through except by trails that may be as little as tunnels where a hunter must crouch to walk through to that of wide open paths suitable for a slow, quite stalk. However, to attempt to traverse off trail through a thicket will quickly educated the hunter and all Mule Deer within earshot. The tree shown in this picture is typical of what may be employed during the season for those lucky to get a Mule Deer tag. This tree is as small as it looks at its location on the top of the small sandy ridge is the highest point on this lease. Its disadvantage is clear as any hunter standing in it will readily expose himself from any direction on this land. Between that of our Whitetail and our Mule Deer hunting it is during Mule Deer season that the hunter will feel more comfortable stalking for his deer and do so in a good pair of leather walking boots. 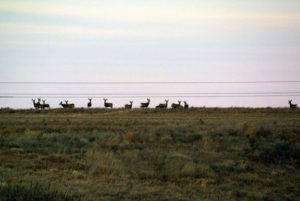 The Mule Deer and the habitat they occupy drives this hunting technique. Every year we learn it bears repeating that where the deer are there are few trees. All recognize Kansas as a great deer hunting state. 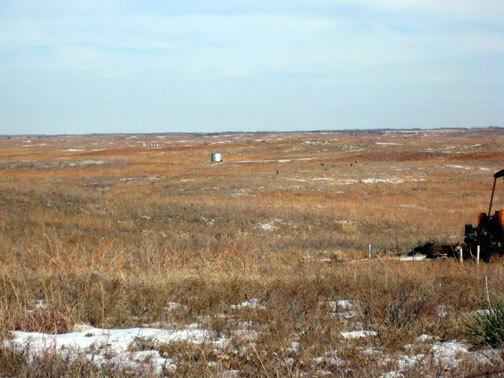 Those some hunters frequently fail to remember that Kansas is a Great Plains State, meaning open land not woodlots. We said this again just in case any one missed not noticing the lack of trees in the pictures. Just got back from deer hunting in [location deleted]. I had an unbelievable time. I harvested a very nice 10 point buck that was huge. 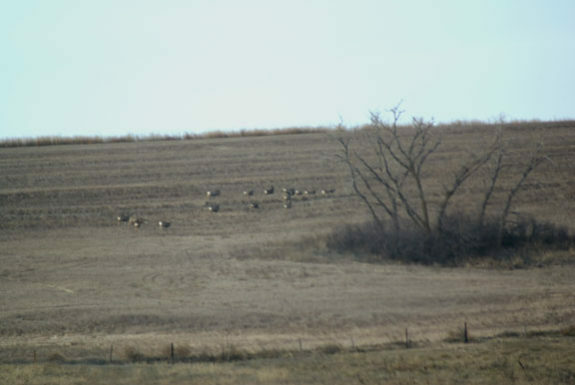 The deer picture did not turn out well, but attached are photos of the landscape south of [location deleted] where the hunt took place. As you can see in the photos it is like hunting out west right there in [location deleted]. I spotted the buck a day before the season opened, glassing him from the road about 3 quarters of a mile away. The next morning I spotted him again and stalked within about 250 yards. As I had a couple antlerless tags, the second morning I glassed again for deer. I should have been more patient, I spotted a monster buck right next to where I had harvested the 10 pointer the day before. Well maybe next year I can find him again. 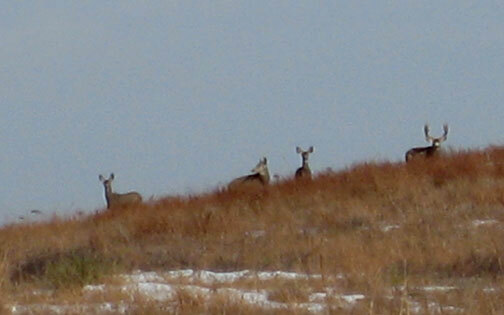 Also attached is a picture of a herd of mule deer doe.